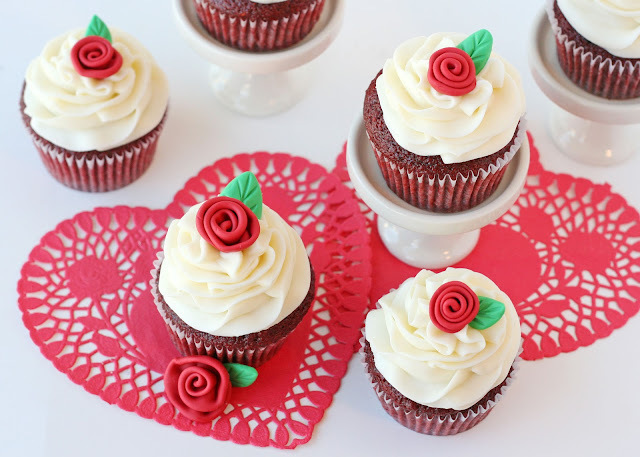 Red velvet cupcakes are a classic treat that lend themselves so perfectly to Valentine’s Day. Although I’ve admired red velvet cake and cupcakes from afar for a couple of years, I’ve never made any. In fact, I hadn’t even heard of red velvet cake until a few years ago. Apparently it’s famous in the south, but being born and raised in California I wasn’t familiar with it. And to be fair, once I learned that they were simply a light cocoa cake with lots of red dye I wasn’t sure I could ever feel really excited about it. Although I obviously use food coloring quite often for cookie and cupcake frosting, I try to avoid using excess amounts. But over the past 2 years of blogging, the one recipe I keep getting e-mail requests for is red velvet. I searched the web for natural color alternatives, but after reading at least a dozen different blog posts I concluded that using natural coloring (from beets, or similar) can be a lot of work, expensive, and often only produce mediocre results. All that to say, these are delicious cupcakes… and yes, they have quite a bit of food coloring in them. 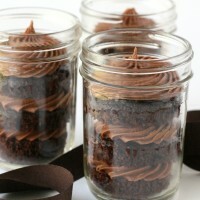 If that bothers you, feel free to make my favorite chocolate cupcakes, or vanilla cupcakes. This recipe is really delicious, and I’m sure I’ll be using it again. There is something a little special about the pretty dark red hue. This cake is a delicious, moist and fluffy, lightly flavored chocolate cake. Different red velvet cake recipes range from containing just a couple tablespoons of cocoa, to being a fully flavored chocolate cake. I would describe this recipe as a mild chocolate cake. As you can see, the color is dark red, or burgundy. If you would like a brighter red color, feel free to reduce the cocoa powder a bit, and/or add more coloring. 1. Preheat oven to 350*F. Prepare cupcake pan with liners, or butter and flour cake pans and line bottoms with parchment. 2. In a large bowl whisk cake flour, cocoa and salt, and set aside. 3. In the bowl of an electric mixer (fitted with the whisk attachment), beat oil and sugar until well blended. Add eggs one at a time, and continue beating. Add food coloring and vanilla and mix well. 4. Add flour and buttermilk alternately, in two batches. Scrap down the sides of the bowl as needed. Mix just enough to combine. 5. Place baking soda in a bowl or cup, add vinegar and stir (it will foam and expand). Add to cake batter and beat for 10 seconds. 6. Fill cupcake liners 2/3-3/4 full, or divide batter between cake pans. Bake cupcakes 20-24 minutes. Bake cake layers 25-40 minutes depending on the size of the pans. 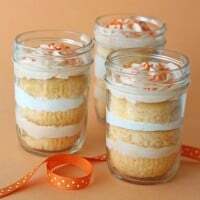 This recipe will yield about 24 cupcakes, 3- 8″ cake layers, or 2- 9″ cake layers. Recipe source- Adapted from “The Confetti Cakes Cookbook” by Elisa Strauss, as published by the New York Times. I scaled down the recipe from the original, which yields 36 cupcakes. 1. Place butter in a large mixing bowl and beat until smooth. Add cream cheese and blend until fully combined, about 30 seconds. 2. Add vanilla extract and powdered sugar (one cup at a time) while mixing. Increase to medium speed and beat until it begins to get fluffy. 4. Beat until fluffy, about 1 minute. 5. Frost cake or cupcakes. Recipe source- Glorious Treats (this is just my version of this very old, classic frosting). I decorated these cupcakes with handmade fondant roses. Here is the Fondant Roses Tutorial. 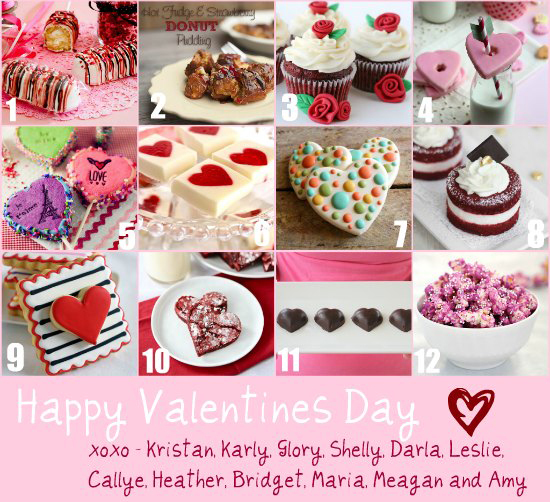 As an extra special treat, I’ve teamed up with a group of amazingly talented ladies to bring you a dozen beautiful and delicious Valentine’s treats! Check out all of these gorgeous creations! Hi Glory! I love the look of these cupcakes. How long does the cream cheese frosting keep for? and can I store the leftover in the fridge? I’ve made a lot of your recipes and have loved almost all of them. I’m positive I made these correctly, but the tops were oddly crusty. I know I didn’t overcook them, because I only did it for 20 minutes. Maybe there was some way I could have avoided this, but if there was it wasn’t obvious. Just wanted to let you know. Thanks for running a great blog! Marielle, So sorry to hear these didn’t quite turn out for you! Without being next to you in the kitchen, it’s near impossible to guess what may have gone awry. Experimenting is a big part of baking, feel free to adjust this recipe as you may see fit. Best of luck with your future baking! Hi Glory, just two questions which i dont seem to understand..
1)Why is baking powder not required in this recipe? And if baking powder is added what difference will it make to the cake? 2)Why is Dutch processed cocoa powder not encouraged in this recipe? What difference will Ducth processed make? Hi Stella, I have only made this recipe with the ingredients just as listed. Feel free to experiment, but I have no way of knowing the results for sure. Hi Glory, I love your recipe. I baked this for my father’s birthday. The cake went so good, but unfortunately not the frosting. The texture of the frosting was not thick and it became runny as I want to frost it on the cake. Hope you can guide me to make a simple and great cream cheese frosting. Thank you! I hope you see this comment, ‘Im wanting to make these today but Im confused on step 4?What do you mean alternating in two batches?Also, would it be okay to use just all purpose flour?Hope to hear back soon THANK YOU! For step four, it means, add some flour, then some milk, then some flour, then some milk. The ingredients listed above are what I’ve used, so I can’t be sure of the results with different ingredients. Feel free to experiment. In general, cake flour produces a lighter, fluffier textue. I imagine all purpose would work fine. love your site and I have had so mich success with your vanilla cupcakes and the hybrid cream cheese/ american butter cream recipe! I made these cupcakes today with blue food coloring instead of red. I loved how fluffy and moist the cupcakes were, even after sitting out of the oven for 30 mins! I used Ghirardelli unsweetened cocoa for these cupcakes and was very surprised to find out that the chocolate flavor was quite subtle; it was a nice change from the obvious cocoa flavor tasted in other recipes. Good job on making a very tasty red velvet cupcake Glory!! hey ! love your recipe’s!!!!!!!!!!!!!!! just one question: is there a substitute for buttermilk? because we dont have buttermilk here in Sri Lanka [where i live]…….. would normal fresh milk suffice?? Can i use mascarpone cheese for the cream cheese frosting? I have not tried it with mascarpone cheese, but feel free to experiment. 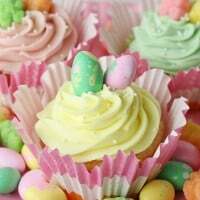 I am an avid fan and I have baked a lot of the recipes you have posted. I recently baked red velvet cupcakes and they tasted great. However, I noticed that after about a day, they tasted bitter. I followed everything, except I used less food coloring (2 tbs instead of 4). I do remember them tasting really good when they came out of the oven. Hi Glory, can I substitute buttermilk with regular milk or maybe cream? And what would be the amount? I just made this red velvet recipe today….and I loved it.! I like that the recipe uses oil instead of butter, it’s so moist and light. I always find cupcakes that use butter a little bit dry. I didn’t have cake flour, so I used 2 cups of AP flour + 1/4 cup of corn flour. I also substitute buttermilk with a mix of plain yoghurt + milk. I reduced the sugar to 1 1/4 cups, since most cake recipe usually too sweet for my taste. Turns out, the cake was not sweet enough. But I did fold in chocolate chips in some of the cupcakes, and it was the perfect sweetness plus the chocolate taste was more pronounce. 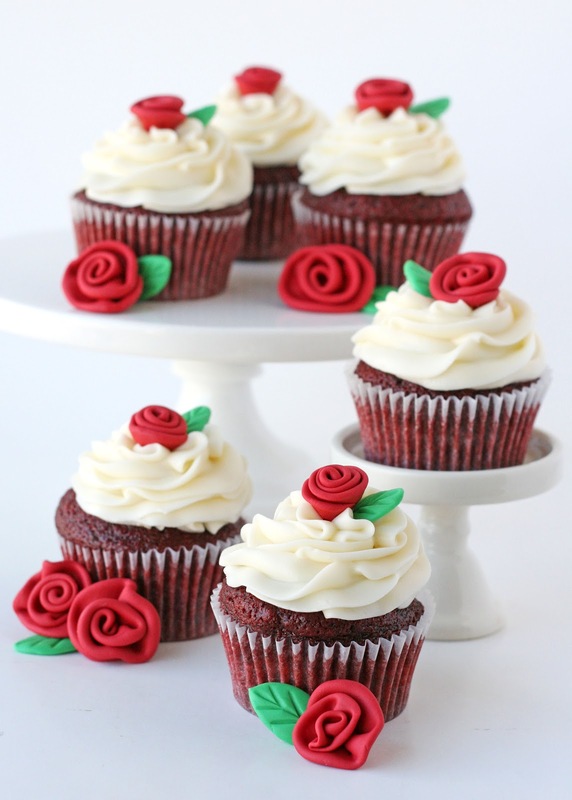 Pingback: Glorious Treats » Red Velvet Cupcakes with Roses Recipe | Recipes, Gossip & More! Hey.these cupcakes look beautiful. Everytime i make creamcheese frosting it comes out too soft and smooth for me to pipe. Any suggestions as to how to get it to pipe nicely as in your photo? Think I may have used 3 cups powdered sugar insead of 4..would that make a difference? I have cocoa, but how do I tell if it is Dutch or not? 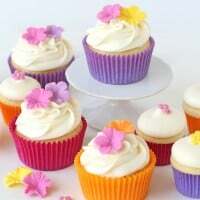 What method did you use to scale down the recipe, I need to scale it down further to make 12 cupcakes. The recipe as I have it listed will make about 24 cupcakes, if you’d like to make 12, simply use half of each listed ingredient. a quick question, in an ideal scenario where I follow the recipe what can cause my cupcakes to peak in the middle? I suspect my rusty oven which I kinda hate but my muffin pan didn’t fit in my countertop oven:( is it the temperature? P.S. Also my frosting was a bit soft..Should I refrigerate it maybe before I use it? p.p.s. And also cake related they became kinda crunchy on the outside and great on the inside.. again I think it’s the oven. . maybe I should reduce the temperature?what do you think?? Hi there every one, here every person is sharing these experience, therefore it’s nice to read this web site, and I used to pay a quick visit this website every day. I plan to try your red velvet cupcakes in the next day or two. Do you know when you might post the info on the fondant roses? Thanks again for sharing your love and passion…such an inspiration! Thanks so much for your sweet note! 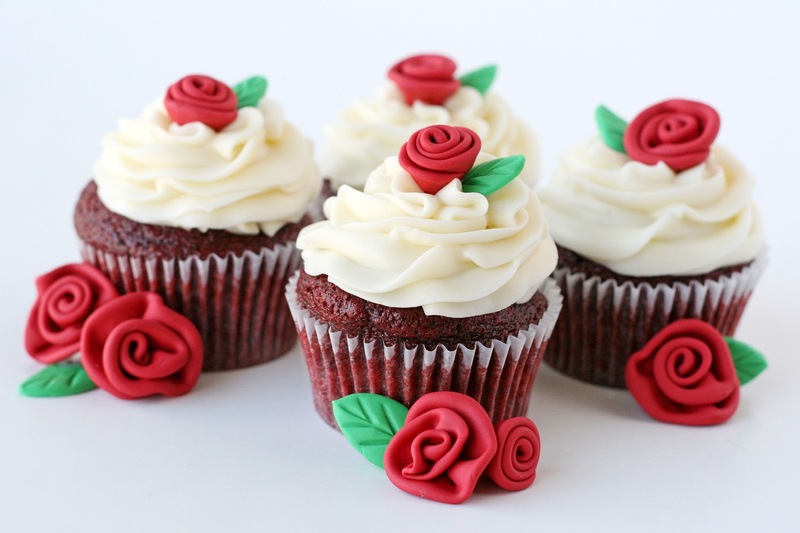 I’m sorry for my slow reply, I have the tutorial on the roses here, http://www.glorioustreats.com/2012/02/how-to-make-fondant-roses-and-leaves.html Thanks for the reminder I need to add the link to this post! I would like to know which tip did you use for decorating Red Velvet Cupcakes with Roses. Love your cupcakes. Hi there. Love, love, love the look of these cakes and plan to make them soon. I know you have clarified which tip you used but I can’t quite see the technique. It’s nearly a ruffle but crossed with a rose? I looked at your frosting tutorial but it’s not there? Could you clarify? I had an hour to bake cupcakes for my twin daughters’ birthday and I turned to the most reliable source I have found for baking, your blog. The cupcakes were amazing and I wanted to thank you for being such an inspiring, amazing baking genius. hi im from canada and i ca’n’t find powdered butter milk can i use the fresh buttermilk my officemates asking for a treat this friday and they specifically requesting a cupcake. im thinking this will be a great idea.. i tried many of your treats they are delicious. I made these yesterday and tagged you in the photo on instagram. They came out great! The frosting was a little bit thin, but it didn’t run from the cupcakes. I noticed some butter stuck to the bottom of the bowl when I was putting the frosting in the pipingbag so that’s probably it, I think.